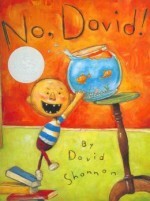 Name of Book: No, David! Literary elements at work in the story: This is a picture book of very rough sketching done to recreate the childhood artwork. The characters are the boy and his mother, and the story is set in their home and neighborhood. It is told from the first-person point of view of the boy, David. How does the perspective on gender/race/culture/economic/ability make a difference to the story? The two characters are a young boy and his mother. They live in a home with many rooms and in a neighborhood with multi-storied homes. The boy and his mother are both white, and there are no other characters. The family appears to be of means, and therefore the pictures may be bothersome to a child of less means. There is also one picture that shows the naked backside of the boy running through the neighborhood. Theology: God declared all of God’s creation to be good and gave humans the dominion over all of creation. Having this responsibility, it is our duty as Christians and followers of God to care for, love and nurture all of God’s creation, even when we may feel it is not deserved. As we grow in our life of faith, we become like new, loving God more than we love ourselves, and loving other people just like we love ourselves. What have you done before that you knew you were not supposed to do? What do your parents and teachers say to you when you do things you aren’t supposed to do? How do you feel when you hear the word “no” all the time? How do you feel when you hear “I love you”? How do you know that God loves you, even though you do things you should not do? No, David! by Storypath is licensed under a Creative Commons Attribution-NonCommercial 4.0 International License.